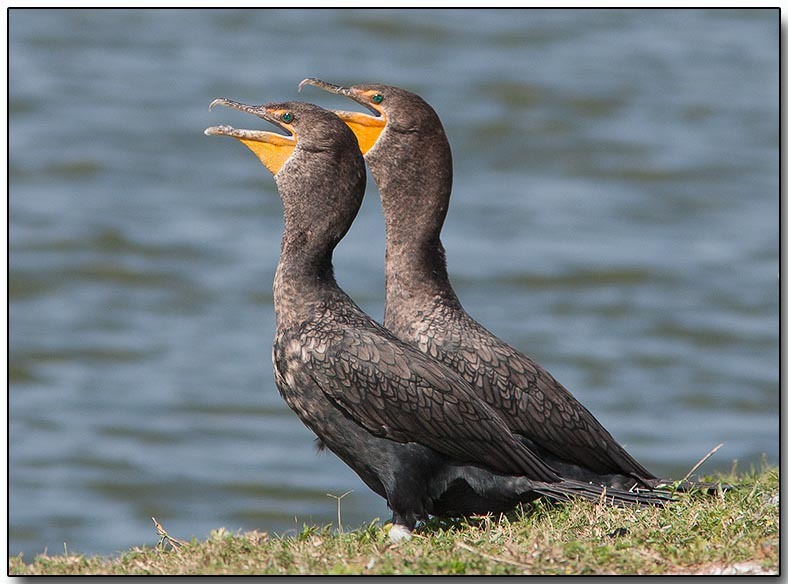 The double-crested cormorant is a member of the cormorant family of seabirds. It occurs along inland waterways as well as in coastal areas, and is widely distributed across North America, from the Aleutian Islands in Alaska down to Florida and Mexico. The double-crested cormorant is found near rivers and lakes and along the coastline. It mainly eats fish and hunts by swimming and diving. It swims low in the water, often with just its neck and head visible, and dives from the surface. It uses its feet for propulsion and is able to dive to a depth of 1.5–7.5 m (4 ft 11 in–24 ft 7 in) for 30–70 seconds. After diving, it spends long periods standing with its wings outstretched to allow them to dry, since they are not fully waterproofed.